The new 2013 Jeep Wrangler Unlimited Moab Edition has won the enviable Four Wheeler of the Year award from Four Wheeler magazine following in the tracks of the Jeep Wrangler Rubicon and Jeep Grand Cherokee that won the last two years. Last September, Torque News profiled the new 2013 Jeep Wrangler Moab and its increased offroad worthiness due to Goodyear Silent Armor tires, winch-capable steel bumpers and an available locking rear differential. These are the very features of the Wrangler – named for one of the most visited offroad destinations around – that captivated the editors of Four Wheeler magazine. "The Jeep Wrangler Unlimited Moab is an extremely versatile vehicle, and was a hands-down trail favorite of the Four Wheeler judges," said John Cappa, Four Wheeler editor. "The improved interior comfort, amenities, power and overall performance both on and offroad make it worthy of being our 2013 Four Wheeler of the Year." To warrant consideration for the award vehicles needed to be entirely new or feature substantial mechanical updates from the last model year. The vehicles were put through their offroad paces on a variety of terrain, spanning pavement, gravel, dirt, sand, rocks and mud covering more than a thousand miles. "The new Jeep Wrangler Moab edition is a perfect example of listening to our loyal Wrangler owners, who appreciate new levels of capability in a unique package," said Mike Manley, President and CEO – Jeep Brand, Chrysler Group LLC. "The Moab edition recognizes a die-hard off-roading destination Jeep owners love, while providing even more capability, including winch-capable steel bumpers, upgraded rock rails and a rear locker. We're especially pleased that the influential Four Wheeler editors put our latest Jeep Wrangler to the test and clearly recognized its capability." 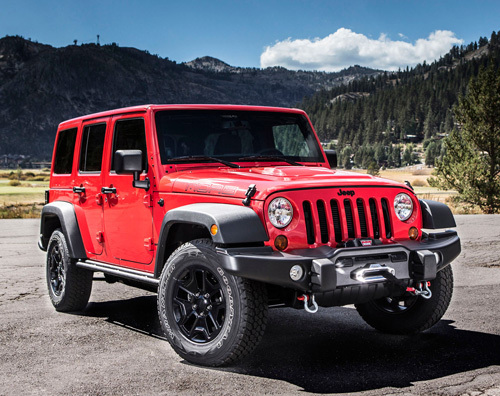 This award comes less than three years after the Jeep Wrangler Rubicon from 2000 to 2009 was labeled the Best 4x4 of the Decade by the magazine. The Four Wheeler designation also comes on the heels of an ongoing parade of accolades that include being pronounced 4x4 of the Year, by Petersen's 4-Wheel & Off-Road magazine, plus becoming Kelley Blue Book's Top 10 Best Resale Value Award and Best Resale Value Award for a Compact Utility Vehicle. Apparently the notice the 2013 Jeep Wrangler Unlimited Moab Edition is getting from the media continues on to the marketplace, as sales for the model are up over 17 percent for 2012.
Who wouldn’t be delighted with one under the Christmas tree this Dec. 25th? Make that the lighted tree in the front yard, okay?